Dog food can be expensive. Then trying to figure out which one is the best to purchase along with recalls on dog food can get you thinking is homemade dog food better for my dog, and how to make homemade dog food to have better control over what my dog is eating might be the better route to go. Is homemade dog food better for your dog than store bought dog food. I am not a certified veterinary nutritionist, so I don’t feel that it would be right of me to develop a recipe for homemade dog food. Heck, I know what my family should eat and all the nutritional needs are not always followed there either. So I won’t be providing you with any homemade dog food recipes. I will provide you with information with regard to what your dog does need in their diet in general terms, along with benefits and risks of making homemade dog food. Homemade dog food is made with fresh ingredients and contain no adders, fillers or preservatives. That alone is very beneficial for your dog’s health. If you have a dog that has dietary restrictions or food allergies, you will have better control of what your dog is eating. I don’t want to feed my dog any food that has the potential to harm him. Concerns about poor quality of food will be removed when you are choosing all the ingredients that will be in your dog’s food. Providing your dog with a variety of flavors. I know I couldn’t eat the exact same thing each day for each meal, and yet we will feed our dog the same food for years. Research has shown many homemade dog food recipes aren’t nutritionally complete and balanced. There are many recipes on the internet that there is no way of knowing what the qualifications are of the person sharing the recipe. In 2014, 200 recipes were evaluated, including 129 written by veterinarians. Only 5 recipes provided adequate levels of all essential nutrients established by the National Research Council guidelines and only 9 recipes met the nutrient standards of the Association of American Feed Control Officials. These recipes were pulled from websites, veterinarians and pet care books. This report is the reporting of The Skeptvet. The other risk of making homemade dog food is following the recipe exactly. You should never change up the recipe as it will change the nutrition. Even cooking chicken with the skin or without the skin or with the bone or without the bone could change the calories. Don’t swap ingredients. Similar ingredients might not provide the same nutrition. Corn and canola oil provide essential fatty acids that olive oil and coconut oil don’t. By substituting you could unbalance the diet. Another study that was done in 2014 on the Evaluation of the Owner’s Perception of Homemade Dog Food shows that after stressing the importance of following the dog food recipe exactly, the majority didn’t follow it, so what is produced didn’t meet the dog’s needs nutritionally. If you are determined to make your dog homemade dog food, don’t just pull any recipe off the internet and expect that it is going to meet all of your dog’s nutritional needs. I recommend getting recipes from a board certified veterinary nutritionists. Your veterinarian can refer you to one. A certified veterinary nutritionist will take into account your dog’s age, weight, and any health problems they may have. They will design recipes suited to your dog’s specific needs. Another option would be an online service called Petdiet.com or BalanceIt.com. Both are run by veterinary nutritionists and they would be able to help you with recipes that will meet all of your dog’s needs. They have an automated online tool that allows you to create customized homemade diets with minimal supplements. Balance It does provide free recipes, and Pet Diet’s recipes are available to download, but there is a fee associated with this service. The good news is you know your dog’s diet will have all the requirements needed to keep them healthy by using either of these services. 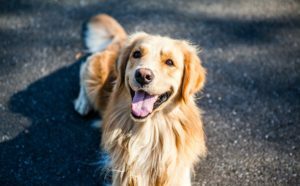 If you are still considering making homemade dog food for your dog, but are now concerned with some of the recipes having all the ingredients necessary to provide your dog everything that they need, there is an option of purchasing a mix that allows you to make homemade food into a nutritionally complete meal. These are commercially prepared base mixes available that are very easy to make. There are dehydrated base mixes that are human grade food. You just add water and it will produce a warm delicious meal. There are no preservatives and no by-products. I would recommend adding a small amount of dry dog food to make sure all vitamins are included in your dog’s meal. 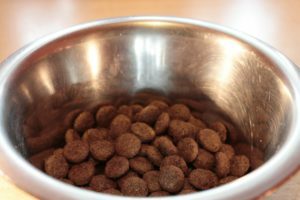 If you are interested in trying this method of homemade dog food that you either take a look at The Honest Kitchen or Dr. Harvey’s Canine Health. Both have several varieties available and different size bags available. You can check prices with Amazon from the pictures below if you are interested. Another option to you making homemade dog food, would be purchasing homemade dog food. NomNomNow makes fresh dog food with each meal customized to your dog based on their age, weight, breed and the amount of exercise that they get. It is only made with human grade fresh ingredients, and it would be an option to providing your dog with the freshest diet without you preparing and figuring out nutritional needs for your dog. Take a look at this NomNomNow Dog Food Review to see how it is prepared and the benefits of feeding your dog NomNomNow Dog Food. There are several food items that are fine for humans but are very toxic to dogs. These items should never be given to a dog, or included in any dog food recipe. Here is the list. There are many different ingredients that are needed to provide your dog with all of their nutritional needs. If you are looking at recipes for homemade dog food, please use this as a guide to make sure you are fulfilling all of your dog’s needs. Calcium – crushed or powdered eggshells, or a supplement. Fatty acids – cooked egg yolks, oatmeal and plant oils. If you are starting to make homemade dog food, it is best to check with your veterinarian prior to feeding your dog his new food. They will be able to help you review your plan and provide you with supplement ideas if needed. They should also weigh your dog after being on the homemade diet for several weeks. Your veterinarian will look over your dog’s skin and coat to make sure they are healthy. Plan on having follow up visits twice a year for your veterinarian to monitor your dog’s overall health. 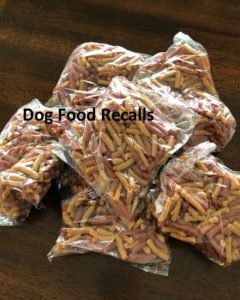 If you are going to go the route of making homemade dog food, I have some items that will help insure you have success. Use a food scale. It is more accurate than measuring cups for measuring meat. Cook meat to kill bacteria and prevent salmonella. Cook grains, beans and starchy vegetables to make them easier to digest. You might need to add some supplements to the food if you are only providing your dog with homemade dog food. Good recipes should include specific supplement instructions. 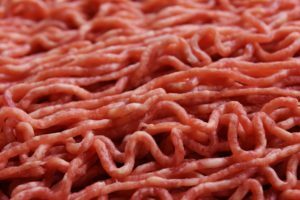 Meat should be lean and have no more than 10% fat. Remove skin from poultry. Dark meat poultry is better for your dog than white meat, unless your dog requires a very low-fat diet. Is homemade dog food better than the risks of what might be in the dry dog food your are purchasing? It can be if you get a recipe from a certified veterinary nutritionist and not just using any recipe you find on the internet. 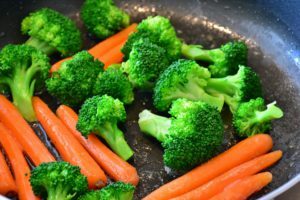 Many of those recipes are vague and even with rotating the diet around, they will come up short in providing your dog with all the nutrients they need. How to make homemade dog food can be difficult and confusing at times if your don’t have a proper recipe to follow. Once you have some recipes that you know include everything your dog needs, make sure to follow the recipe exactly and don’t make any substitutions. If you like to get creative, do that with homemade dog treats. It is safer, since they aren’t expected to provide your dog with all of their nutrition. To save time, make dog food in large batches and freeze in serving size zip lock bags. Then you just need to thaw as you need. Don’t just change your dog over to homemade dog food. You should blend the old with the new over a few day period. This will help your dog get adjusted better and reduce the risk of your dog getting an upset stomach. If you have any questions or comments, please leave them below. You can follow justforyourdog.com on FaceBook, Pinterest or Twitter. 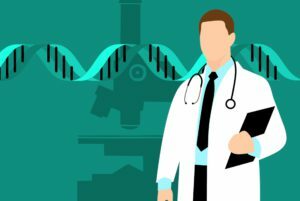 Some of the links within this article are affiliate links of which I might receive a small compensation from sales of certain items. I do feel that giving our dog homemade dog food is benefical from the standpoint that we know exactly what we are feeding out dog. I do however caution that the recipes that are used for homemade dog food are developed by someone with dog food nutrition experience. There are many things that your dog could be missing if you are careful with how the recipe is developed. I am so glad that you read several of my articles and found them useful. As to your question about the best dog toys to keep your dog entertained, I recommend reading 7 best interactive dog toys. If you are short on time, I would recommend the iFetch Ball Launch. This great toy will launch the balls for your dog and if you can teach them to put the ball back in the launcher, they can play whenever they want, all by theirselves. There are different sizes, so you would want to look for the size that works for your sized dog. I really like this post. Our family just did get a dog and we fed her one brand and then decided to change it and it seems she didn’t like the new food. She barely eats it so I was thinking of cooking her dog food at home. I didn’t realize though how much dogs shouldn’t have certain things. I am glad I have waited to do this. I will have to talk to her vet before doing this as you have mentioned. If I had not of read this I might have done something bad for her with good intentions but never the less harmful. Thank you for this post and I am sure there are more dog lovers who need to read this. I think it is a great idea speaking with your vet before starting with homemade dog food and ask them their recommendations. When people decide to make homemade dog food, they are just trying to make their dog’s healthier. It is best to get your recipes either from your vet or from a pet nutritionist to make sure all of your dog’s daily needs are being meet. Good luck with it. I hope it goes well for you. I really do find your article very educational when it comes to homemade dog food vs. store bought. I agree so far in what you saying and I do know about certain risks when you feed the animal the wrong food but, I am also concerned about store bought dog food. Sometimes I really get the feeling you can’t trust anything anymore. 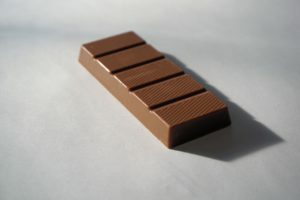 As you have written in your article there are, sometimes, recalls by certain Brands, the same for us humans, and you really don’t know for certain anymore what is in the food altogether. I personally would rather go homemade and will take the necessary steps to feed my dog as healthy as I can. I remember that my parents did feed our dog with homemade cooked food and he was healthy and lived until he was almost 19 years old. I certainly do think a bit more clearly after reading your article and will make up my mind if I like to try to go homemade. Thanks for all the information appreciated. I do believe that our dogs could live longer on homemade dog food. My concern with homemade dog food is where is the recipe coming from. Just because I can whip up all kinds of food in my kitchen doesn’t mean I would know about including everything that a dog needs in their diet. There are so many people posting recipes that have no experience in pet nutrition, that getting recipes off the internet is concerning. I recommend speaking with your vet like you mentioned, and if you decide to go ahead, get recipes that are designed for your dog from a pet nutritionist. That way your dog should stay healthy.